Google “climate change” and the top two hits are websites that are part of NASA’s online climate portal, followed by a Wikipedia entry and the U.S. Environmental Protection Agency’s climate website. Websites maintained by the federal government are among the first online stops for the general public — from students, local policymakers and everyone else — to learn about climate change. There is rising concern among scientists and climate communications experts that those websites may be among the first to be deleted, politicized or degraded with inaccurate climate information after President-elect Donald Trump takes office in January, all of which would impact the public’s understanding of the science and urgency of climate change. Trump is populating his cabinet with appointees who reject established climate science and have pledged to overturn nearly all of the government’s climate regulations and pull the United States out of the Paris climate pact. Scientists worry that the Trump administration will neglect or delete critical climate data on government websites, and researchers are scrambling to download the data to ensure it is preserved. But there is fear that Trump’s cabinet officials will also remove or distort basic climate information that the general public often relies on for its understanding of global warming. The climate change doubters and denialists in Trump’s transition team and cabinet have significant authority within the agencies they lead, strongly suggesting that the climate information the public sees on federal websites is at risk, said Susan Hassol, one of the co-writers of the three U.S. national climate assessments and now the director of Climate Communication, a nonprofit climate science outreach organization. “If we are to take their public statements and writings at their word, the threat is acute,” she said. In addition to maintaining critical — and continuous — datasets on weather and climate, federal agencies provide a trove of basic information designed to educate the general public about climate change. 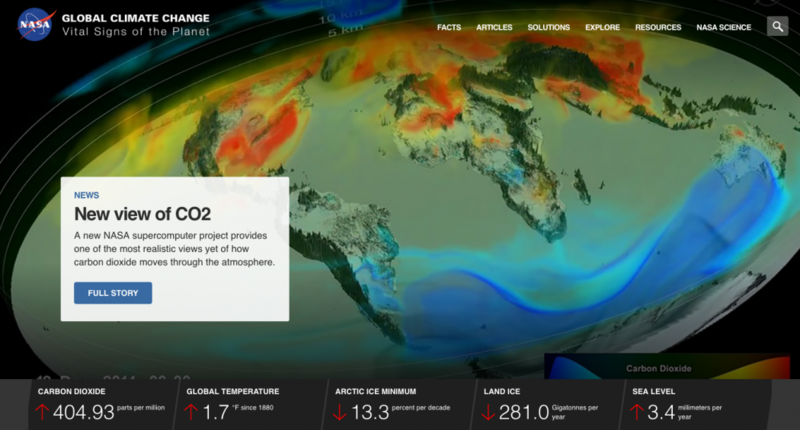 Websites such as Globalchange.gov and NASA’s “Vital Signs for the Planet” offer basic facts and data on global warming for a mass audience. 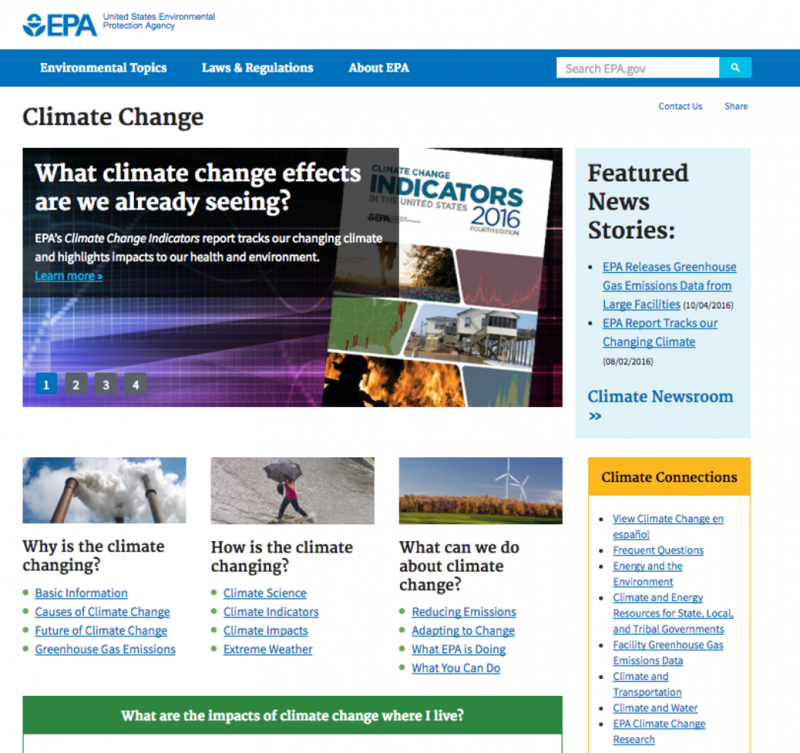 The EPA’s website is full of basic information about U.S. and global greenhouse gas emissions. 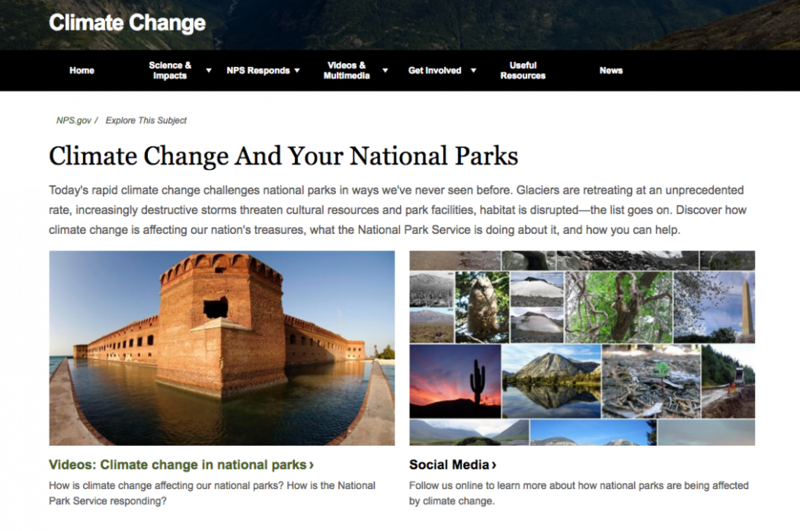 The National Park Service has a website that can answer questions about why climate change is melting Glacier National Park’s namesake glaciers and the role of global warming in threatening the Everglades. Americans could be misled about the world’s scientific consensus on climate change if the information on government websites is removed, watered down or distorted, she said. People looking for basic information could seek it from sources that may not be as vigilant about the accuracy of the information they present. Kathleen Jamieson, director of the Annenberg Public Policy Center at the University of Pennsylvania, said federal government websites providing basic information on climate change serve as primary sources of information for the general public. They are also used by journalists to find climate facts when federal agencies such as NASA or the National Oceanic and Atmospheric Administration make major announcements about alarming climate trends. Policymakers also rely on federal government websites focusing on climate change, she said. There is precedent for government officials who disagree with the importance or accuracy of established climate science removing politically inconvenient information from government websites, Hassol said. When this was exposed by a whistleblower, Rick Piltz, Cooney resigned and secured a job with ExxonMobil, according to the New York Times. “It would be very disturbing to see the purveying of this kind of misinformation to the public again, especially on government websites that are known as trusted sources of objective information,” Hassol said. Any Trump administration effort to reduce the quality of climate information available to the public on federal websites could have other consequences, Rosenberg said.